Home » 5 Freshest » Happy Halloween! These are Terrible Coconut Candies! My first review in weeks if not months. So sad it’s been that long. I blame you, dear readers, for not making me feel wanted. Actually, that’s totally unfair. Let’s be real. It’s because my work is unsanity and we just moved houses and all my energy has been sopped up in reality. Wouldn’t it just be perfect if i was reviewing a candy that was simply wonderful? Yeah. good luck. See that green color? It looks bad, huh. It is. It’s supposed to taste like lime, but it’s pedestrian, lime-extract lime. No depth. See the macaroon type texture? It looks like there’s real coconut and maybe it is, but it’s more of a chewy-gooey coconut. 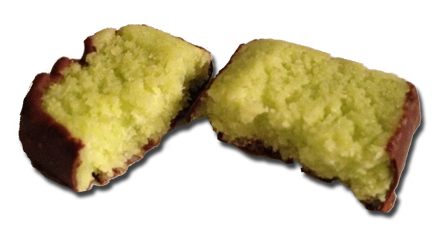 Which works great in Almond Joy but not with mediocre chocolate and weak ol’ lime. Also, there’s a strange moisture in these that when you bite in, it kinda feels like it wrings out in your mouth. Are these a candy? A cookie? Who cares. They’re awful. Boo. Blech. Perfectly scary for Halloween though, you have to admit. They look like chocolate covered bile.